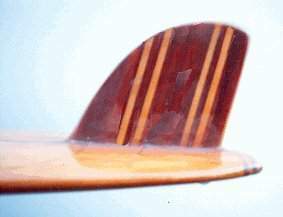 Chambered balsa blanks with three 1" redwood stringers and 5 piece tail-block. redwood with 2 x 2 balsa strips and glass bead. Purchased circa 1963, by John Sentence, Llangollian Avenue Enfield, Sydney. Purchased by Frank and Betty Cater as Christmas present for Geoff Cater, December 1965. 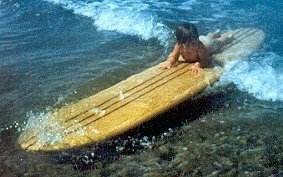 Board reshaped as 8 ft Pintail in the winter of 1968, a case of backyard butchery that confirmed the chambered construction. COMMENTS: Companion board to # 24. Surfabout Volume 1Number 1 August 1962 page 32. Lynette Cater, Seven Mile Beach, circa 1966. 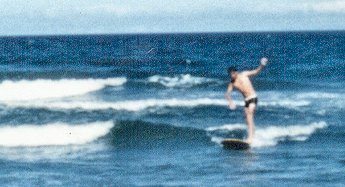 Geoff Cater, Seven Mile Beach, circa 1966. 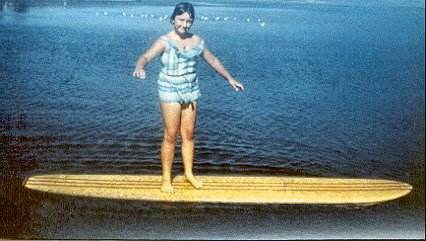 Diane Cater, Shoalhaven River, circa 1966. 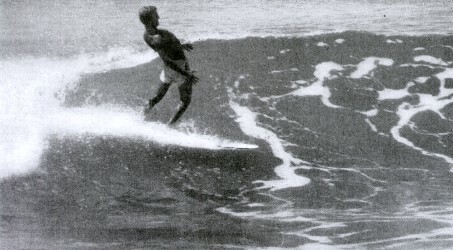 Geoff Cater (2000 - 2016) : Wally Carle Balsa Malibu, 9ft 4'', 1963.